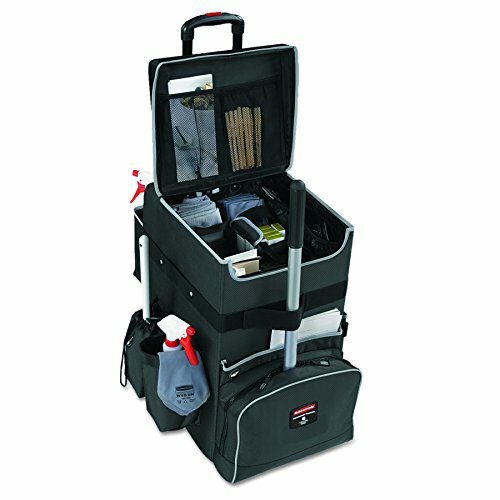 The Rubbermaid Commercial Products 1902465 Executive Janitorial Housekeeping Quick Cart is the industry’s most durable mobile cart solution for housekeeping, janitorial and maintenance environments. Heavy-duty strap secures stick tools; large front pockets can hold a flexible flat mop or sweeper. Teflon fabric protector coating protects cart from unsightly stains in the course of daily use. Lightweight, polypropylene fabric construction provides years of service life. Adjustable dividers helps organize amenities and supplies. Quick cart caddy included with cart. Heavy-duty strap secures stick tools; large front pockets can hold a flexible flat mop or sweeper. Teflon fabric protector coating protects cart from unsightly stains in the course of daily use. Lightweight, polypropylene fabric construction provides years of service life. Adjustable dividers helps organize amenities and supplies. Quick cart caddy included with cart.